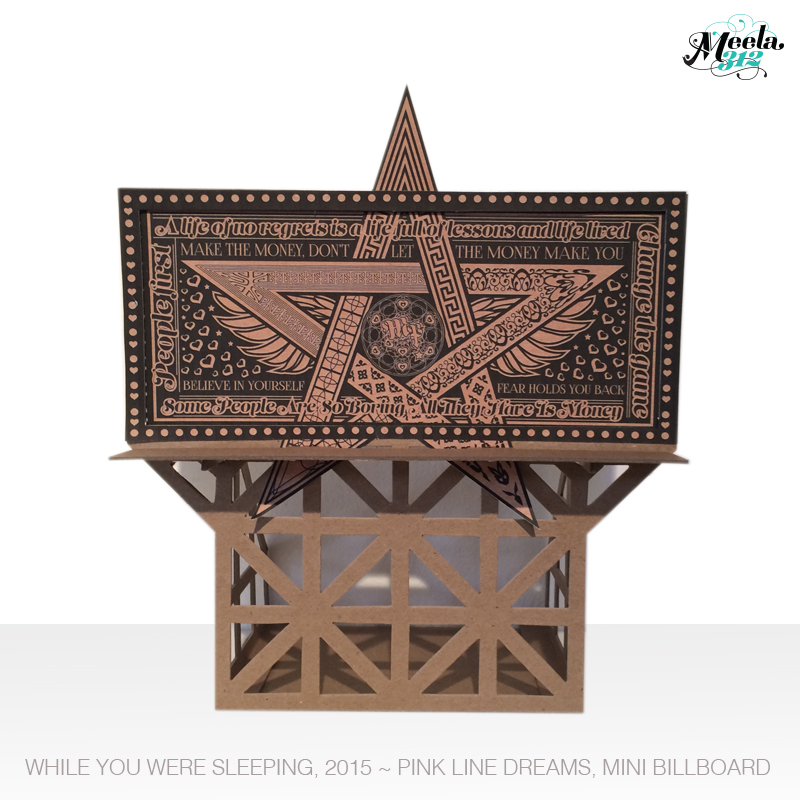 Meela312 is a Marketing Design Artist. Her art practice is a critical reflection of her awareness to media and religious representation. Through her art she expresses her euphoria, insight, sexuality and understanding of her life experiences. Her art is magic, bold, provocative, sexual, urban, unafraid and dramatic. She uses bold colors, esoteric symbolism, glitter and glamour to engage her audience. She combines light & dark elements to convey the dichotomy of her religious upbringing and inherent positive deviant energy. She uses mixed media, aerosol paint, and found objects that symbolize and inspire her interactions with life as an Artist, Mother, and Chingona. The Chingona brand was made to empower women to be brave when they want to give up. It was created to be worn like a superwoman badge because we must do the things in life that need to get done. 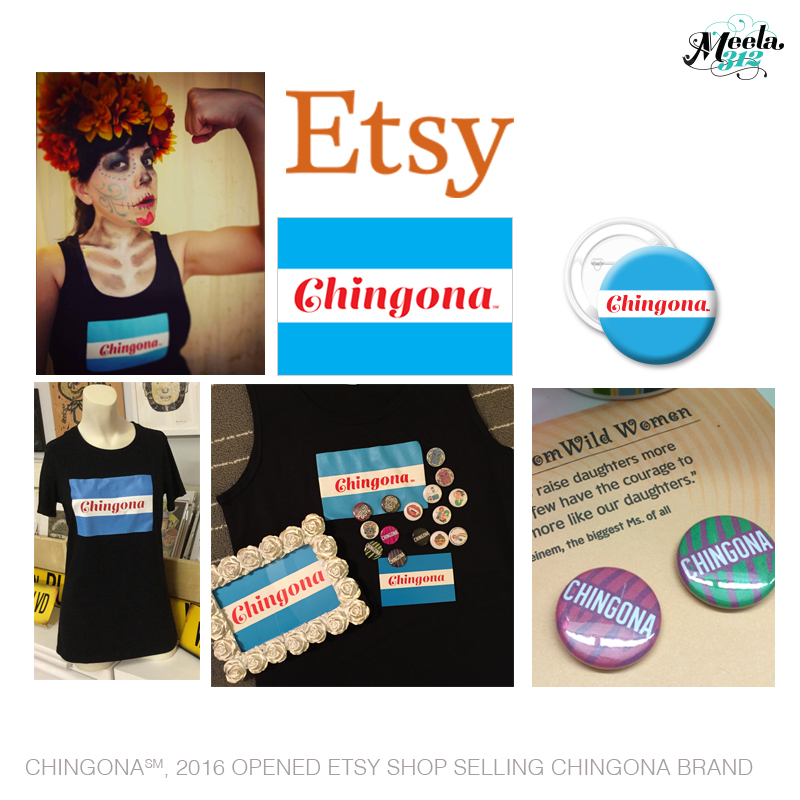 The original Chingona logo was created to resemble the Chicago flag to signify the origin of my roots. Chicago and my family created the woman I am today. Read the full story of how the Chingona Brand was created. Representing my son, my life partner & myself as the 3 Kings. We are royalty and divine, we care for and support one another with joy and love. My Kings protect their Queen. 3 has always been a significant and magic number for me. It is represented in my artwork and life. 13 is my studio number, it was my water-polo cap number and soccer jersey number. No one wanted 13 it was an omen. I often found the toughest opponents also had 13, this number has always suited me fine. We give power to what we believe in good or bad. I created this sculpture with the remanent jewelry I had worn from a previous employer who fired me. I gave this costume jewelry a new life as personified royalty. 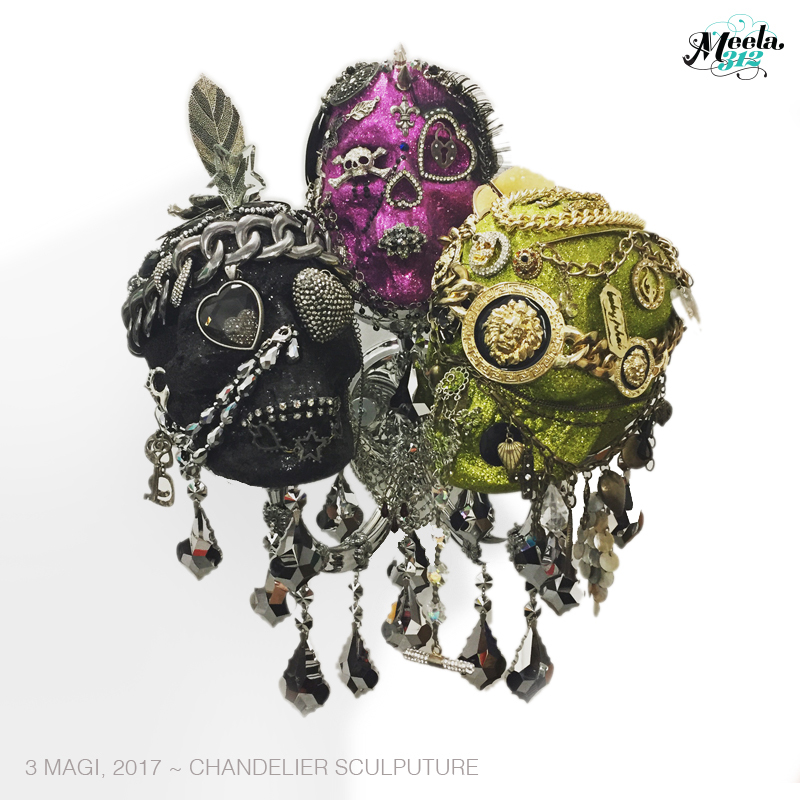 I meshed glitter and gaudiness to create a warrior feathered chained crown, a studded mohawk, and an asymmetrical modern headpiece. The studs were from the leather collar and jewelry I wore as a punk industrial vampire youth. My partner has hearts in his eyes for me and carries the key to my heart. I have love and death in my eyes, I am a paradox personified. My son is still young and can only partially see from his privileged Versace eyepiece. He looks up to us for guidance and we will teach him everything we know so he can be stronger and wiser than both of us. We are fierce and embellished with powerful symbols. We will live to 100 years. In 2016 I was granted a low-income ticket to Burning Man. I had always heard about this festival and had always wanted to attend. Originally I was going alone, as I could not find anyone willing to join me on this adventure. I was scared but confident with my own resourcefulness. I was ready to test my “self reliant” ability. I had to bring my own tent, my own bike, my own food and carry my own water. Travel on a plane and get a bus ticket to the festival. There is no currency at Burning Man. Everything is given as a gift. Everything is different there. There are white out sand storms, where you can not see past 5 feet in front of you. During that time you have to stop and wait it out. The air is dry and full of sand. There is no running water. My skin became like clammy leather. My hair was like the Bride of Frankenstein, it stood up without product. There is minimal to no cell phone service, I was able to send one text. It felt like we were on Mars. It was amazing. After spending a week in Vegas with Jose I realized he would be great company at BM he is also very handy. I invited him to join me. He said yes. He found a ticket, brought me a bike and picked me up from the airport with his truck from Los Angeles. We shared this experience together. He is now my Life Partner. There is a giant wooden man in the center of the festival. There are wooden structures that people can walk around, in up and down like a 3 dimensional maze with stairs and bridges all made of wood. At the close of the event all of these wooden structures are burned. There is a leave no trace rule at BM. You must take everything with you, even your garbage. There are also workshops that Burners host. One of these workshops allowed us to bend metal rods from blazing red heat. Jose and I each made a random swirly rod. He chose the round one, I chose the square one. When we were done I noticed the two pieces formed a heart shape. 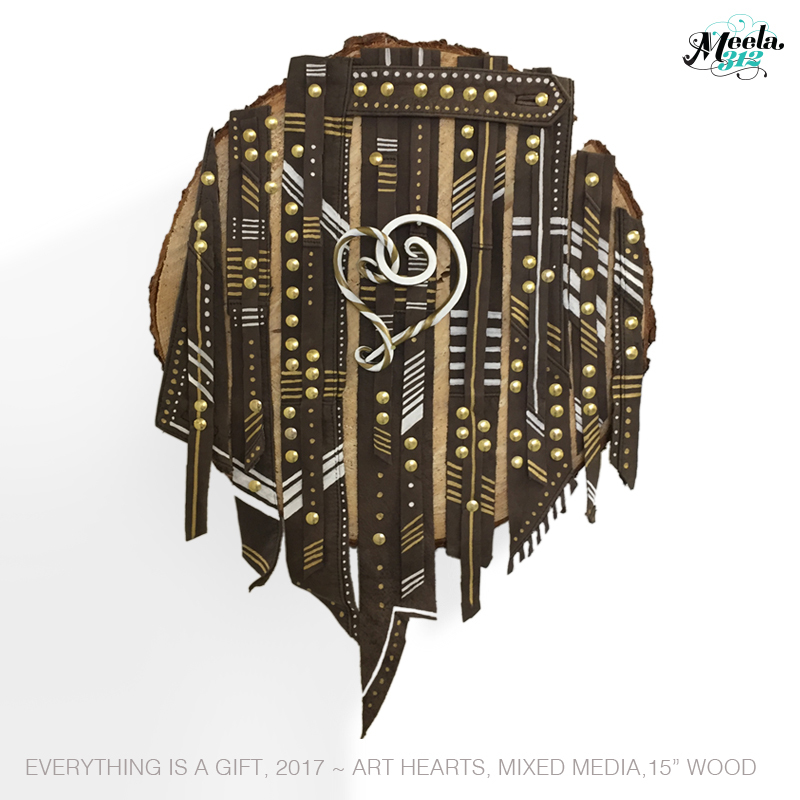 I created my piece to convey the tribal earthy feel of Burning Man and as a place to mount our metal shapes together. I have an affinity for the color gold and used white marks to represent the power of Indigos. Ideas travel through people until they find someone who will bring them to life. Give life to your ideas until they are completed. Then go on to the next idea. You will learn and you will grow. There is no instruction book on life. We get to figure it out, that is our journey. We have the privilege to decide our destination. I met my future husband this summer and we are both Pisces. My birthday on Feb 28 & his on March 1st. Teal is our favorite color. He gave me these three pieces of material as a gift so I could “make something”. I used them to represent an ocean. I made the fish from Sculply clay. I deconstructed a music box to make the fish swirl around on the stick as if they are swimming. Two fish swimming is the icon for Pisces. When you turn the knob the fish dance around to the chiming of a music box. The silver sticks represent coral in the ocean. The background is textured like a coffin but also like waves in water. Based on the style of one of my personal favorite Graphic Designers, Shepard Fairy my billboard for Pink Line Dreams Exhibit, curated by Naomi “Monstrochika” Martinez. I created an inspirational billboard because it breaks all the rules of Graphic Design when making a billboard. We would not have time to read a billboard if we were actually driving. The text is too long but since it’s an art exhibit, where people would have time to actually stop and read the billboard message I wrote inspirational messages that resonate with me personally. One of the quotes is from Macklemore a conscious rap artist whom I admire for his music, courage and personal messages to live his dream. “Make the money, don’t let the money make you. Change the game, don’t let the game change you.” To me this means stay true to yourself, stay humble and remind ourself of where we came from. I don’t know anyone who had or has an easy life. I feel our simple beginnings form us to become exceptional adult persons. We are each ouur journey and vision of success. Fear is a common crutch people use to hinder themselves. Once we release it’s power we are free. Our mindset hinders our ability to grow or our ability to learn. It’s our choice. In my life journey I have met people who have so much money but are so boring. I’m not sure if they even realize it. I don’t want my bank account to ever dull my appreciation of a good life. Suze Orman is a Financial Advisor whom I admire. I watch her talks on channel 11. She has a saying “People first, then money, then things” It’s sound and simple advice that is so obvious but growing up not everyone learns this message. The top quote my own, “A life of no regrets is a life full of lessons and a life lived”. Personally I have no regrets in life. I did not always listen to my family growing up but I always decided what I wanted to do at that moment because that is what I wanted. I have learned the hard way, often on my own but in return I have a life I am proud of and happy to live. The Pentagram, five pointed star is a Wiccan symbol celebrating the Samhain or Fall Festival Celebration. In collaborating with Delilah “Zena” Salgado with her annual “Beautiful Soul Coffin Show” I incorporated this symbol because of the fall season festival honoring the Spirit, Water, Fire, Earth & Air. The top row has 35 dots, representing my age. Wings for my family last name and 6 hearts on the side and in the center representing my son’s age. My logo in the center of it all. I chose to maintain the original cardboard craft paper background in my piece. I wanted to replicate what the piece would look like if I had actually printed on the model kit. In a perfect world, with no budget. I would have printed directly on the billboard or created an embossed piece similar to a letterpress. The theme of the Spudnick Press Cooperative: Steamroller Spectacular at Printers Ball 2015 was “Push & Pull”. Artists were asked to physically, metaphorically, and politically reflect on this concept. Parenting is a constant push and pull daily occurrence. As a parent I feel my child will be my contribution to our collective community. My effort, struggle, praise, and life experiences will teach him how to act as an adult and foster the kind of person he will become in our world. Parenting has forced me to examine my role as an adult and a provider. I have observed the realm of parenting styles and see the direct connection parents have on their children. I do my personal best to show my son ethical values, structure, empathy and healthy lifestyle options. I cannot protect him 100% of the time but I can make the best choices for him and instill good values in his heart so that when he is faced with life’s many challenges he will know what the right choice is. At his young age, he has faced the normal issues most Kindergarteners have experienced. When his fished died, he learned about death. Everyday, I make him brush his teeth. Every meal has vegetables. Every school night he will have homework. He challenges me, we do negotiate terms but his “options” are dictated by me. This was my first wood carving piece. I enjoyed the process of learning a new medium, meeting new artists, creating unique prints and bringing my son and his friend to the steam roller event. These two little boys 6 & 4 were in awe of watching a big steamroller print a collection of woodblock prints. They were excited to see young man, playing guitar for the event. The boys also participated in a workshop where they were able to choose a small plant in exchange for contribution into a collective sketchbook. After I finished carving my block I made prints with Hoofprint Studio. Liz & Gabe are supercool experienced printers with an awesome printshop in Little Italy on Oakley in what used to be a funeral parlor. I purchased had made decorative papers and asked them to print my woodblock with gold or white ink. I wanted to keep the prints colorful and uplifting to represent the the positive energy I work toward instilling in my son. They were also participating in the event and carving their own blocks to submit as well. In the end my prints came out beautifully and they also made me extra prints using black ink. Although my intention was to stay away from black ink, the black ink printed well because it had the most contrast. I chose the words Love Light Teotl because this is the energy I give my son daily. I show him love everyday. I guide his thought process in a positive direction as a light when he is struggling in his everyday situations. Teotl is his name. Teotl is from the Aztec language Nautl, it means infinite energy of the universe. I chose this name to remind him of our Mexican heritage and make his presence in the world his own. The starburst represents the sunlight I receive from him everyday. He is my light. The letter style is based on the combination of calligraphy and Old English graffiti style fonts. I have always been intrigued to fonts with this combination of swirls, custom penmanship and medieval theme. As a child the vampire world was fascinating to me. As an adult this theme attracts me. I am an old soul. I appreciate the dichotomy of good and evil working collectively. As a person and artist this is my guise. This is life’s balance. I created my Hello Kitty as inspiration of the character “Malkina” from the 2013 Ridley Scott film, The Counselor. Malkina has no limits, she is an annihilist, a cunning, manipulative and evil villian. I normally side with the “good guys” in all stories but this character was like no other villain I could imagine and she was a woman. She used her attractiveness and sexuality to persuade men and women in her favor. She passively aggressively intimidated the other female character because she envied her. Makina’s boyfriend Reiner was “in to her but afraid of her”. In this film Malkina and Reiner watch their own pet cheetahs hunt pray as a spectator sport while drinking wine, wearing fancy clothes, lounging next to their fancy SUV. Malkina has a cheetah pattern tattoo on her back. Everything about Malkina is evil. Evil has always been interesting to me because behind every evil person is story about WHY they are evil, bad upbringing, mental instability often both. I am not afraid of what most people perceive as evil. Once we loose our own fears we are free to do anything. I combined this character with a halloween costume I wanted to create for my self. The costume was an all white & silver goddess with an elaborate feathered head piece, dramatic make up and a painted body. I painted her chrome as a shield from any harm. Her body is covered in a bejeweled cheetah pattern of black and clear gems to harness her animalistic power animal. My Hello Kitty is a combination of my super Ego self. Using the strengths of all these characters but for good. I was first introduced to Hello Kitty by my aunts. They were in High School when I was in grammar school. I looked up to them so much they had cool hair and clothes, could dance and create artwork. Sometimes they would babysit me and introduced me to all kinds of cool things. I would say I was about 7 when they let me borrow some of their Hello Kitty pencils to do my homework. They had several items of Hello Kitty, small toys, trinkets and stickers. Looking at these cute characters so friendly in their magical land they made me feel happy. As I grew up I became a fan of Hello Kitty and these happy feelings are relived every time I see anything Hello Kitty. Going through my phases of self I began to identify more with Kuromi, the “evil” Hello Kitty. She gets into mischief and likes boys. This character was the top of my cake when I turned 30 and later became one of my tattoos. I live an adventures life and these little characters dramatize a fantasy world in a delightful way. 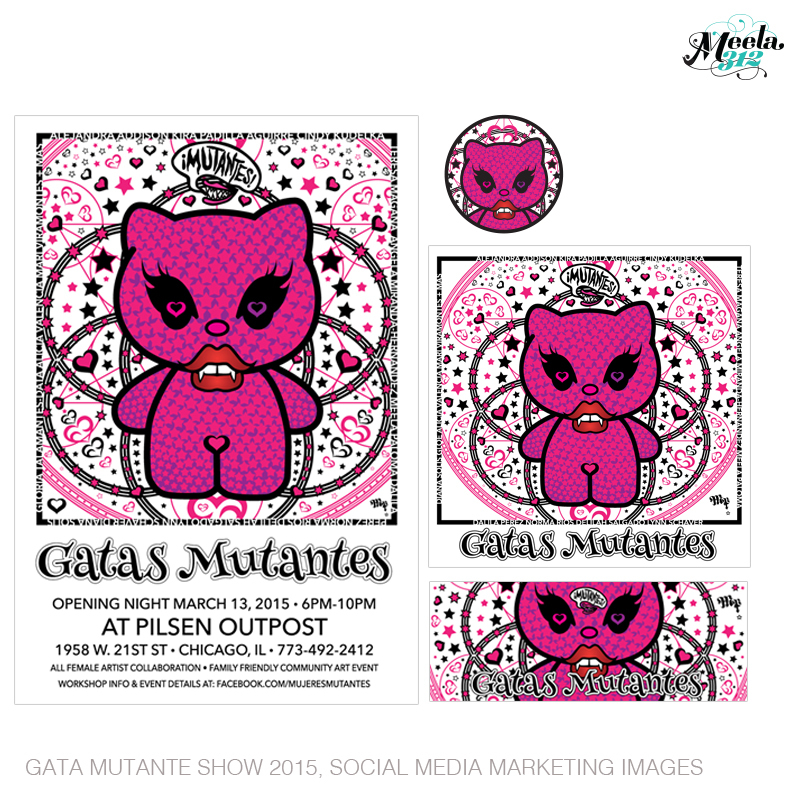 I created this icon to promote the Gata Mutante Group art show featuring over 14 female artists. I was influenced by the graphic work of Shepard Fairy, Bratz Dolls, Sacred Geometry, Hello Kitty, sexiness,, symbolism and ordered chaos. The mutantes logo on top was the former Mujeres Mutantes Logo. Names of the initial artists are in the border. This logo identity was not well received by the group some members thought it to be offensive because her “hoo ha” had a heart in it and they thought this would not be appropriate for a family show. Some of the women artists covered up the heart with words or cropped it out. The “hoo-ha” has a heart in it to represent the sacred female entity. When more young girls and women realize their sacredness is a gift and put value on their sexuality they will value their self worth. This is appropriate for children because if my son questioned it I would have explained all of his questions in a scientific way so that he is informed about sexuality and I have and always will teach him to respect women and their moon time. Art creates dialogue. Parents need to parent. Abstinence does not prevent pregnancy. I love this layout it embodies all the above mentioned inspirations that are dear to my heart. It looks simple but was very time consuming and fun. Indigo Printing did an excellent job with this complicated piece. I made buttons of these icons in different colors. Sacred Science became an influential theme for me personally this year. Gold has been my color of the moment. The textured pattern vinyl wallpaper, geometric textured pattern paper, vintage sconce and faceted mirror create a unique beauty, that soothes me. The combination of these found objects, create a beautiful idea from a symbol of death. Perspective is relative. If gold attracts, this is my power. 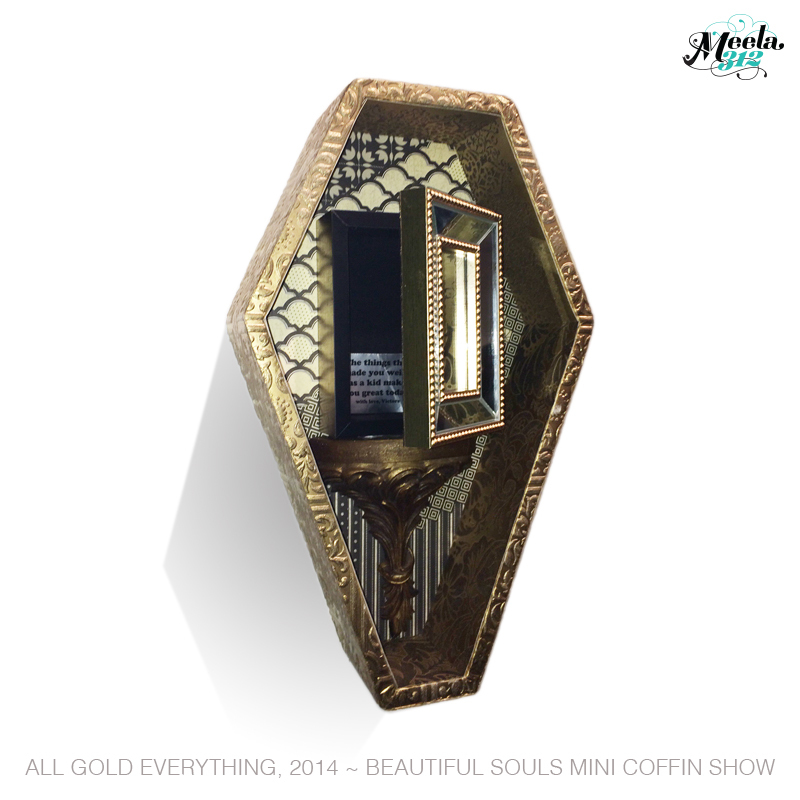 This coffin has become a source of energy. The mirror reflects self because we are the source of all our energy, of all our happiness, all of our abundance. We attract what we internalize. Our words have power, our thoughts have power. “The things that made you weird as a kid make you great today. with Love, Victore” I was fortunate enough to attend the Adobe Creative Expo in Los Angeles, October 2014. One of the guest speakers was New York Artist, James Victore. He passed out these stickers to the audience. His presentation provided powerful motivation for me to create work that was important to me and help me to realize the value of my creative message. My work is a gift and I should share my story. Looking forward to 2015.